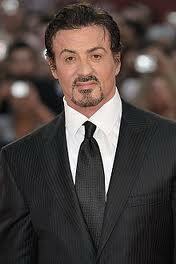 Sylvester Stallone, one of the stars of the new movie The Expendables 2, said that on the set, the cast was very competitive. Stallone returns with the latest sequel of his 2010 action packed hit, along with other action movie heavyweights Jean-Claude Van Damme, Arnold Schwarzenegger, Jason Statham and Dolph Lundgren. Stallone said he was not surprised that because of all the testosterone and on-screen muscle that some friendly rivalries took place. The star of Rocky said it was quite competitive, as no one wanted to be second, so everyone pushed hard and because of that, the actors in the movie have established reputations, as always wanting to be the best. Schwarzenegger agreed with Stallone by saying that all of the people on the set helped him tremendously since he had been away from movie sets for the past eight years. Stallone said everyone came together, which made shooting the movie terrific, but at the same time created strong competition. Schwarzenegger, the former Mr. Olympia and Mr. Universe, said the group was always competing to see whose muscles were the most defined and who in the group had the best overall body, with the lowest amount of fat. He said there was competition for who had the bigger gun, who killed the most bad guys and who killed in a unique way. Stallone said it was difficult to stop performing his own movie stunts, even though his doctors strongly suggested he should not. He said he had to have his neck fused due to a stunt in the first movie. A number of operations followed he said and the doctors said to let the guys who are paid to be stunt men do the work. However, he said sometimes he could not help himself. The movie will appear in cinemas across the U.S. August 16.